Lip and cheek tints are definitely every girl's best friend whenever we're in a rush but still wanna look finely flushed. It's convenient and easy to use especially when you're always on-the-go. I came across different brands who offer all the shades in the world, but nothing comes close to the latest trend in town. 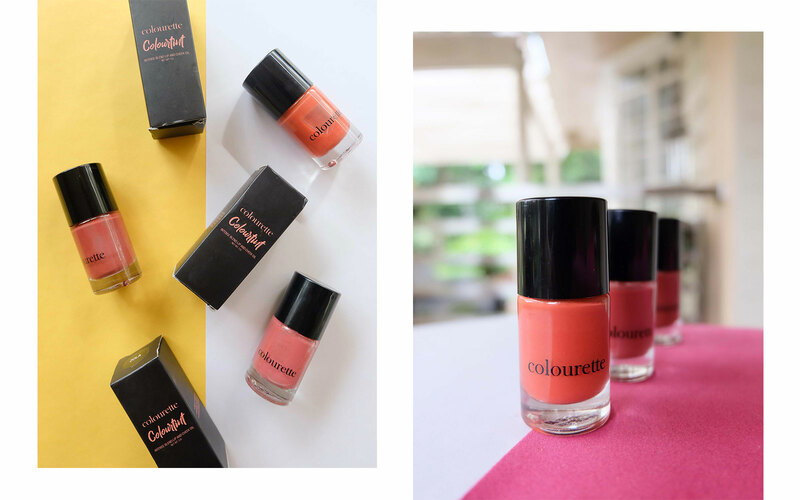 Colourtint Intense Blend Lip and Cheek Oil by Colourette Cosmetics was launched earlier last year and it has taken beauty b/vloggers and make-up enthusiasts by storm! I know I'm quite late to the party because I was a little hesitant at first. Most lip and cheek tints retail for about 80 to 140 while this one is sold at twice or thrice the price. And an oil-based tint? It's relatively something new to me, but it definitely changed the game. Colourette Colourtints have a total of nine shades to date, ranging from peaches, oranges, pinks and reds. They are sold at ₱249 each for a 12ml bottle. The brand claims to be boldy-pigmented and has a hydrating formula containing SPF 15 for a moisturized yet sun-protected lips and skin. I got mine in the shades Dione, Naomi and Zola so I could try how the different shades would look on my skintone. Disclaimer: Apologies for my uneven skin. I wasn't wearing foundation because I had to swipe the tint off after each swatch. And I didn't post-process the photos to show you guys how it really looks like. 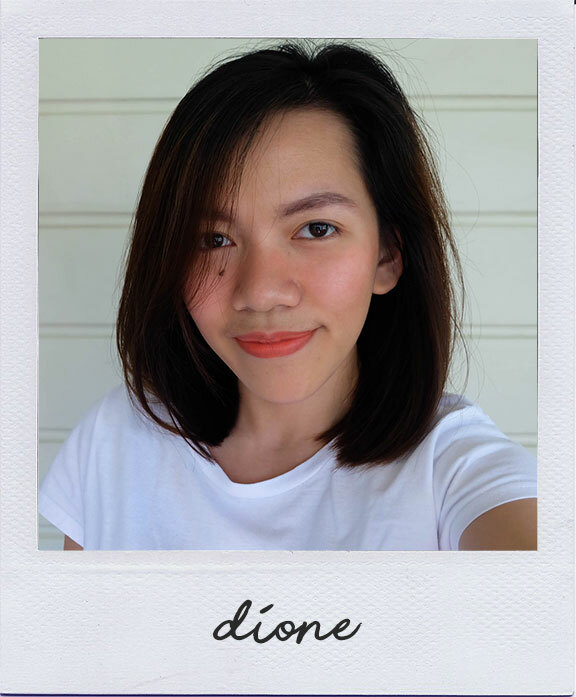 Dione is an orange-y shade. Looks best on morenas for a flushed, sun-kissed look. The formula is a little less concentrated compared to the other two I've tried, which is great for a more natural and subtle look especially as a blush. 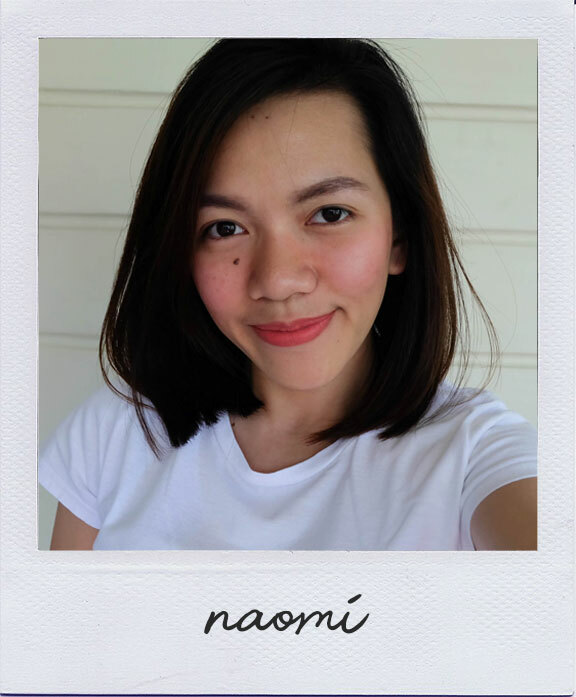 Naomi is a shade of pink. It is one of their latest releases along with Coco. This shade is very buildable, and I think it's suitable for most skin tones. 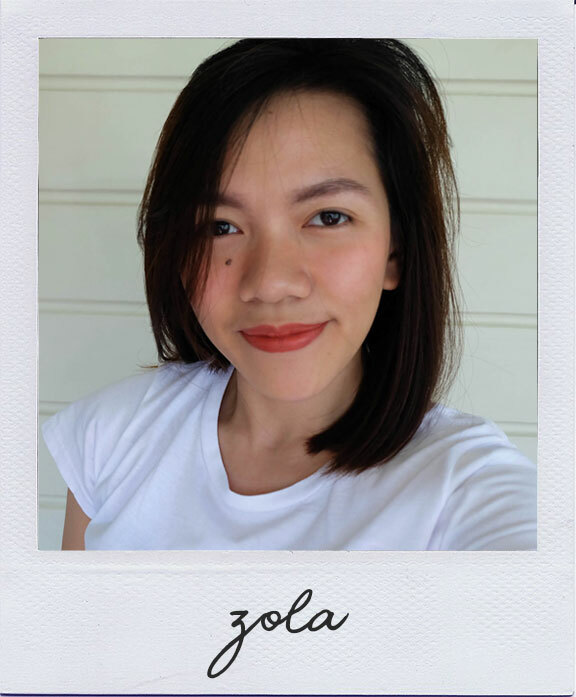 Zola is a brick red shade. Formula is more concentrated than the other two (has denser pigmentation), which makes it buildable, so you can easily go from au naturale to on fleek with a few more swipes. Can also pass for a drunk blush. PACKAGING. 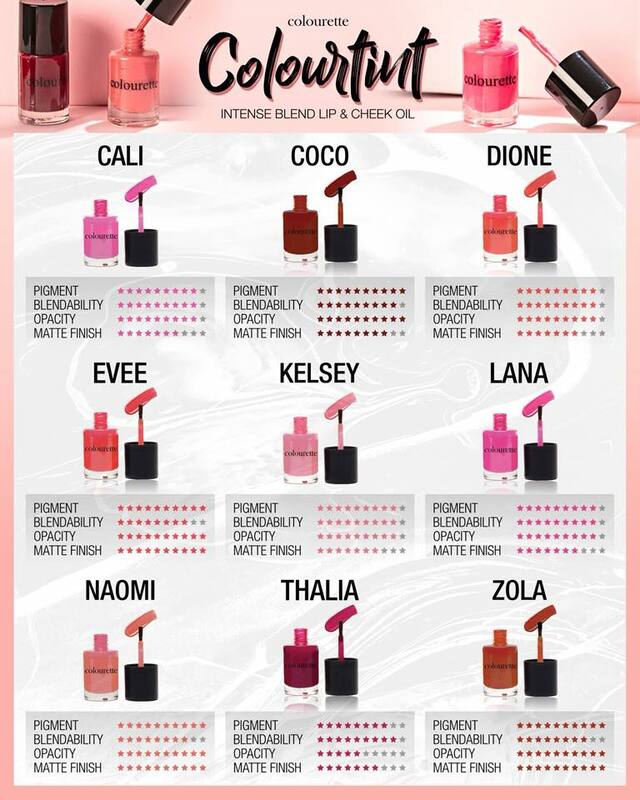 Unlike other lip and cheek tints that are in roll-on bottles, Colourette Colourtints are in a small glass packaging similar to nail polish containers, with a label at the bottom indicating the name of the shade. I think they're a bit fragile being in glass bottles, so make sure to close them properly after use to avoid mess and spills on your kit. APPLICATION. Because it is an oil-based tint, the formula tends suspend from the liquid, so you have to shake it first before using (as indicated on the packaging). The brush applicator is also similar with nail polishes. I normally apply it in the middle of my lips and on my cheeks, then spread it using my fingers. PIGMENTATION & FINISH. True as it claims, these Colourtints are insanely intense! A little product goes a long way. Three dots are enough to cover each cheek, and swipe to pop some color on your lips. It applies as an oil then dries as a stain after a few seconds. 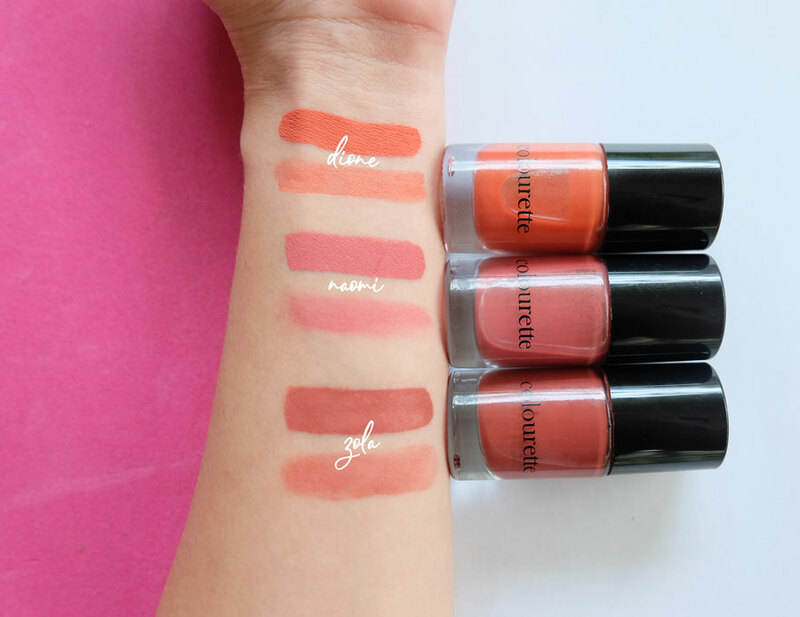 Sometimes you'll even forget that they're just tints because it can achieve a liquid matte finish with enough swipes especially with the darker shades (see arm swatch). You also have to take note that the pigmentation/actual color varies based on the natural color of your lips. LONGEVITY. It can last for a good 4-6 hours as a lip tint, depending on what you eat, and can last all-day as a cheek tint. OVERALL. So far, I'm loving these Colourtints! I think they're pretty worth it for ₱249, considering that you'll only be needing a few amounts per use. Most lip & cheek tints don't work as a lip stain for me, so I really like that this one works with uhh-mazing results! It's really perfect for everyday use! Just the right amount of blush that lasts all-day long. Have you tried Colourette Colourtints? Which ones are your fave?